One night a few weeks ago I was blending panels with Distress Oxide ink for backgrounds. 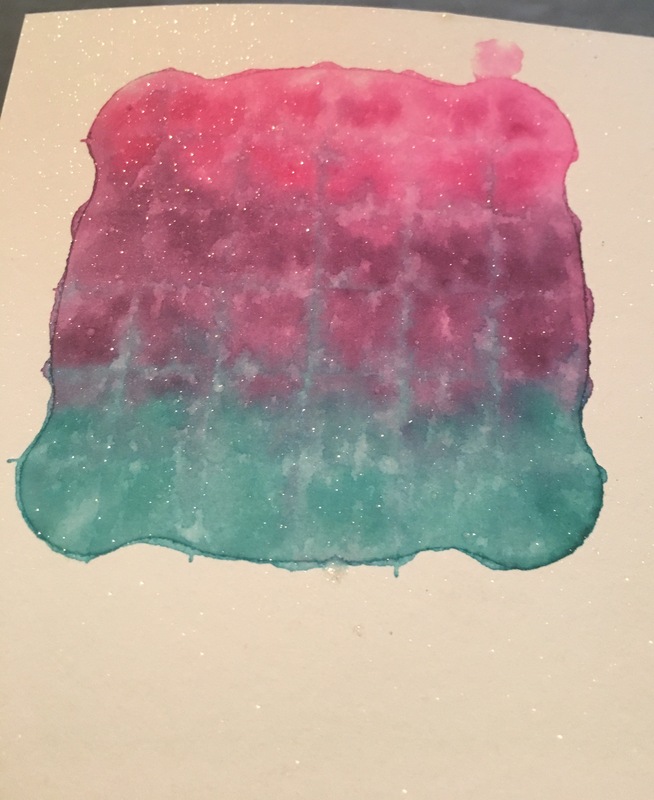 Since I had my supplies out, I decided to try the Block Watercolor Stamping technique Jennifer McGuire shared on July 3rd (here). I was just playing around, so I didn’t take any pictures while I was doing it, which I regret. 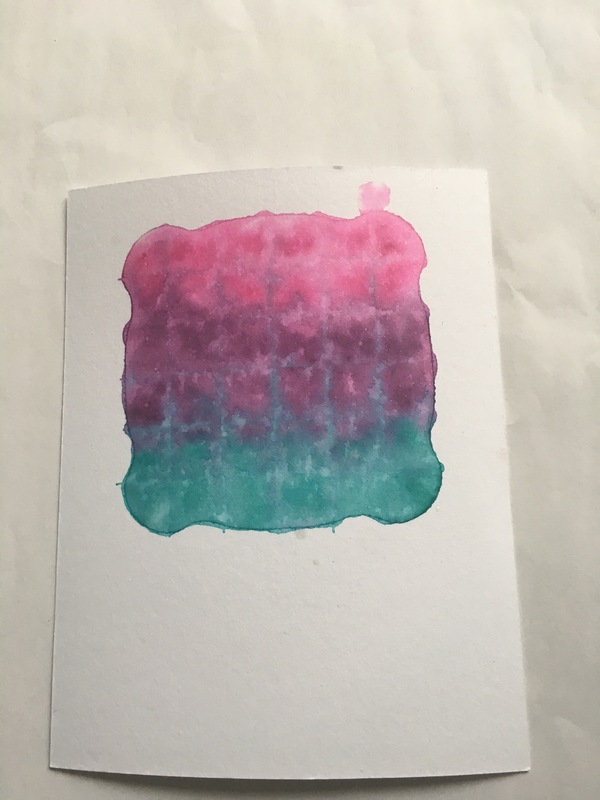 I guess I didn’t think it would work this well (I tried this when I first started making cards and utterly failed). I watched Jennifer’s video, so I already had an idea of what it would look like, but that’s nothing compared to seeing the magic in real life!. My acrylic blocks have grid lines on them, to help you stamp straight. I didn’t really think about it in terms of how it would effect the outcome. It gave a pretty neat affect on some of the backgrounds. 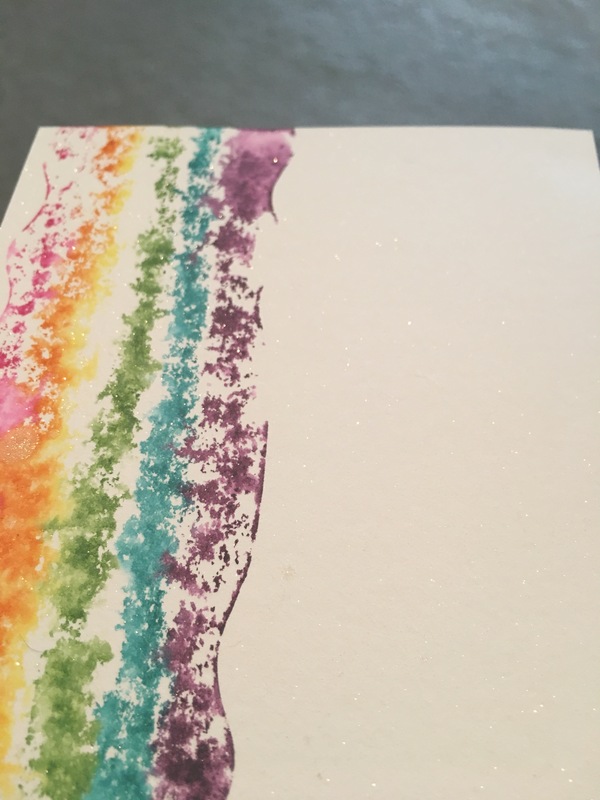 I used Distress Markers instead of ink pads, and I used Tim Holtz Distress Watercolor paper. On the first panel I used Picked Raspberry, Peacock Feathers and Seedless Preserves, and colored the block pretty heavily. Then I hit it a couple of times with a water spray bottle. 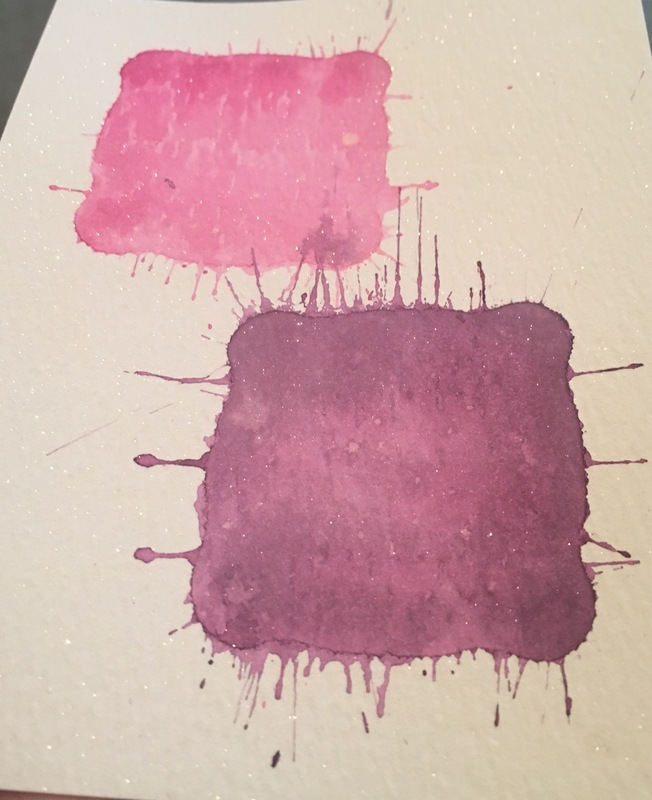 I placed the block on the watercolor paper and then placed my mini binder full of dies on top. I let it sit for 5 minutes. When I took the block off, I blotted the panel. Then I sprayed it with Sparkle Spray. You can really see the grid marks on this one. I think the ink traveled up and down them. I love how it’s so different. On the second example, I took a smaller block and just used Picked Raspberry. 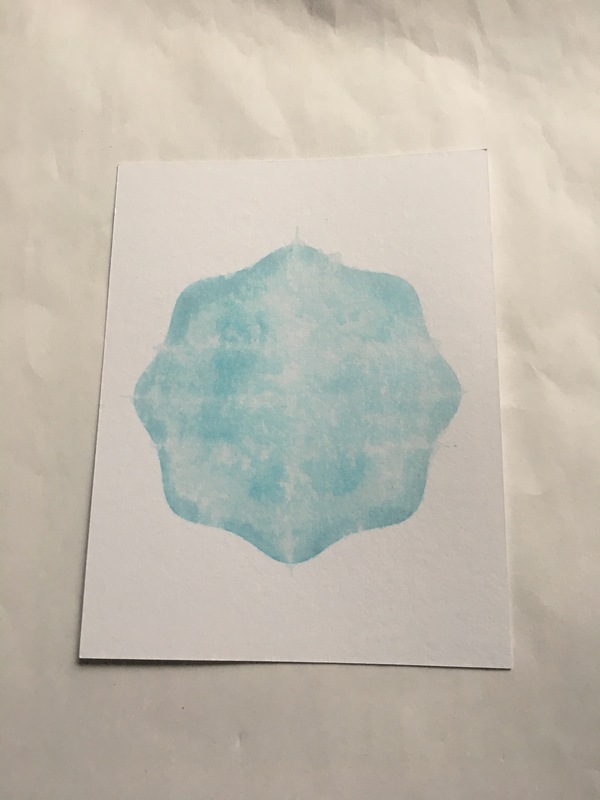 I sprayed it with water and put it on the watercolor paper. Then I put the water bottle on it. I put the bottle down a little hard and got the splatters out of the side (not intentionally but love it). After 5 minutes I repeated the same steps with Seedless Preserves. 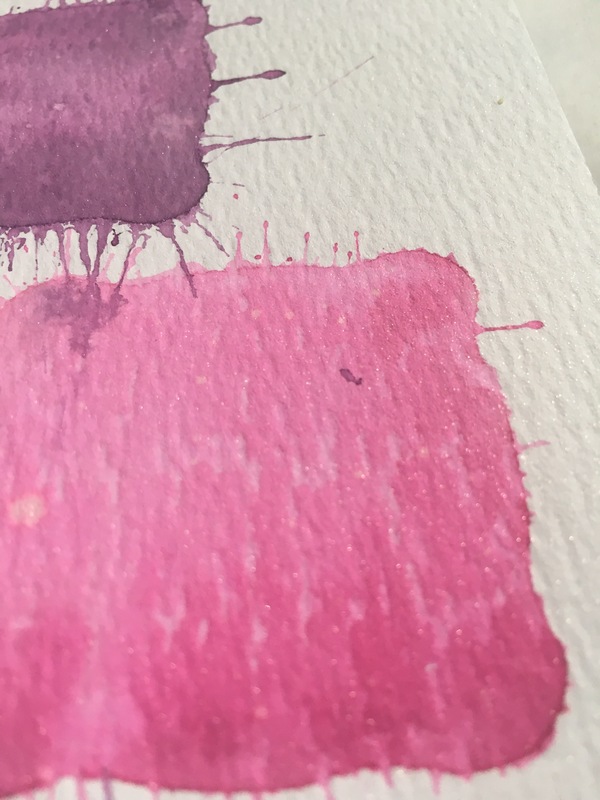 This time I hit it on purpose which resulted in bigger splatters. I blotted the panel when I took the block off and then I sprayed the panel with Sparkle Spray. The Sparkle Spray made the color run a little, where the purple and pink overlap. This one is my second favorite! Here is the finished card. You may recognize it from my shaker card post. 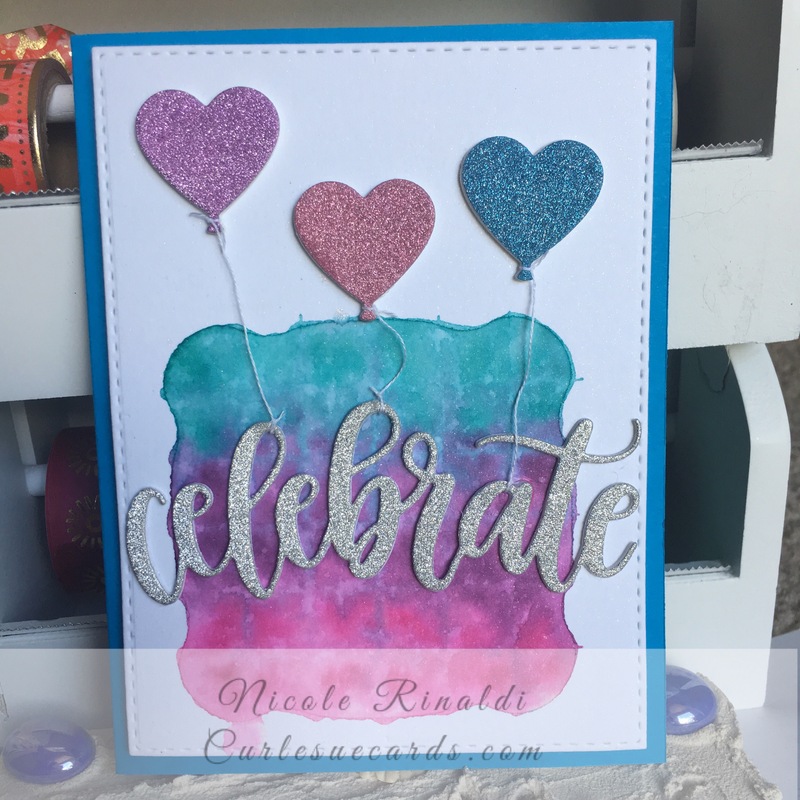 I used the Big Hugs from MFT Stamps. I wanted to keep the watercolor as intact as possible, so I adhered the cut out letters to the inside of the shaker. On this panel I colored a rainbow with Picked Raspberry, Spiced Marmalade, Squeezed Lemonade, Cut Grass, Peacock Feathers and Seedless Preserves. I sprayed it with water, but not as much as the other panels (again, unintentionally). I placed it on the panel, put something heavy on it and left it for 5 minutes. As you can see, less water means less movement. I’m still happy with the look. I sprayed this one with Sparkle Spray too. This one was perfect for a Stamping Bella Unicorn. This card makes me so happy, with all the color, AND my favorite unicorn. With my last panel, I used only Broken China. I inked the block up and sprayed it with water. I placed the block on the panel and let is sit for 5 minutes with something heavy on it. This one is my favorite! I love the shape from the block and the soft color. Adding Sparkle Spray made it gorgeous! I wish the Spray photographed better. 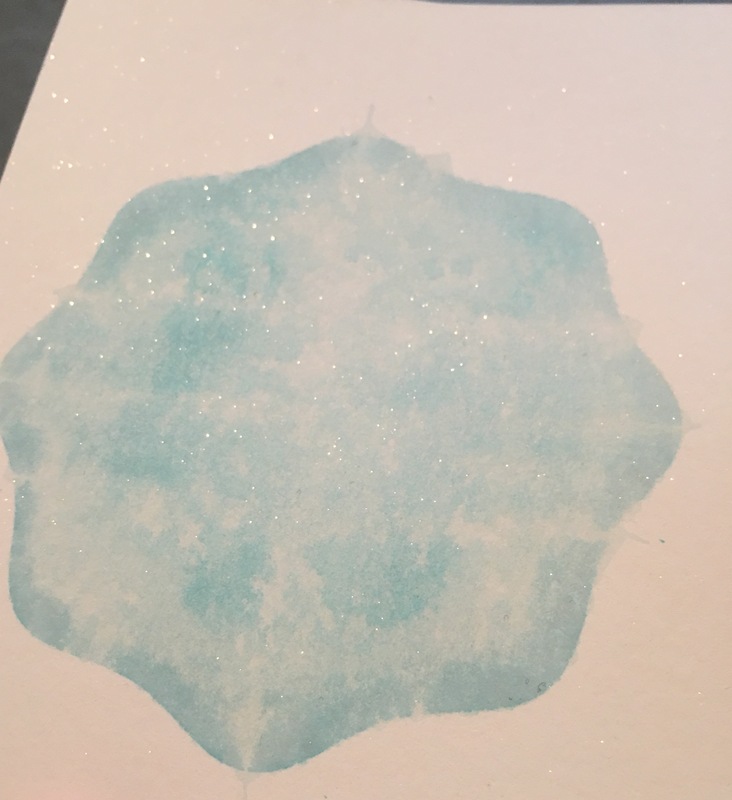 I know I’ll be repeating this for more cards, it will make a lovely sky. This time I added a mermaid from the Hero Arts May 2017 kit. 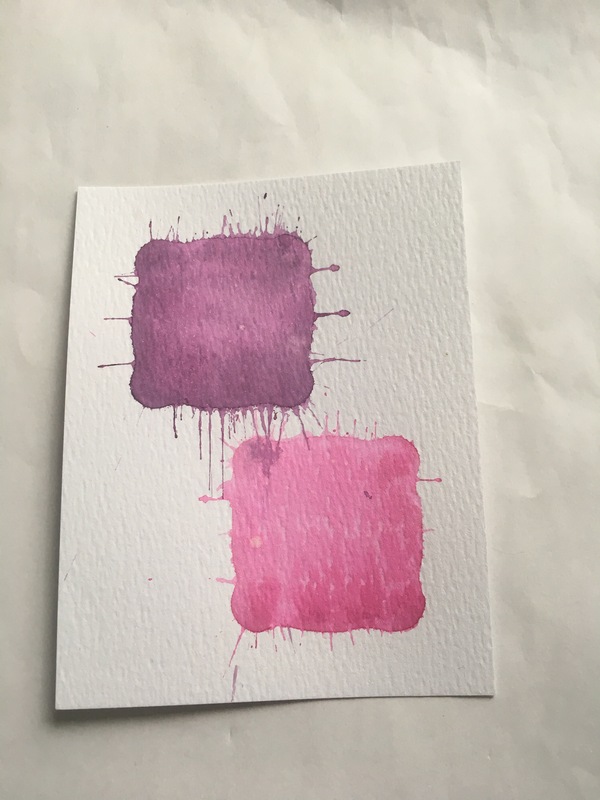 I’m really pleased with the outcome of “just goofing around.” I need to play with ink more often and I recommend this technique. It’s super easy and even if you don’t “get it right,” it still has amazing results. The key is to make sure you let the block sit for at least 5 minutes. The first time I tried this I didn’t wait and it didn’t work at all. Thanks for sharing your technique Nicole. It looks like a pretty birthday cake with balloons on top. So glad you joined us for the CASology anniversary challenge!